I have to tell you all, that I am honored to be a member and co-author of the Grief Diaries Anthology Series. These books literally touch your heart and bring a sense of compassion and cohesiveness, as individuals share their experiences through a myriad of topics including grief and loss while shedding light on hope that lies ahead. Grief Diaries-Will We Survive was released Dec. 29, in which I had the amazing opportunity to co-author. Part of the award-winning Grief Diaries book series, Will We Survive offers a unique glimpse into the impact on marriage and relationships following child loss. Many parents shared their thoughts and experiences on life after loss, covering topics such as blame, guilt, coping strategies, intimacy and much more. A valuable asset to couples everywhere that are enduring loss. It is available for purchase at Amazon and Barnes & Noble. If you haven’t heard of the Grief Diaries, please visit their website. Who knows, you just may want to share your story as well. “Grief Diaries is a village of people helping people. We’re contributors, experts, coaches, authors and healers who raise awareness about stigmatized experiences, and help people just like you through advice, comfort and hope. Grief Diaries is a groundbreaking series of anthology books featuring true stories about stigmatized experiences. When we share stories, our written words become a portable support group for others who share our path, and help raise awareness and shed insight into our experiences. Not too long ago, I finished another wonderful read: A memoir of struggle and perseverance resulting in tremendous growth. It was heartwarming and tragic, yet beautifully inspiring. It left me with a powerful sense of accomplishment and triumph. Running In Heels is about personal sacrifice and deep love. Mary longs for the love of the mother she needed but never had. She gave thanks for a loving grandmother who gave her the solid foundation amidst the terrible storms in her life. I could not imagine living through all the trials she went through as a little girl and young adult. It tore my heart open when I experienced, through her eyes, all the sadness, abandonment, devastation and abuse she endured in her life. However, through it all she remained courageous and brave. I kept thinking while reading it, I could never be that strong. So incredible. I was in awe. Thankfully, I didn’t have many challenges in my childhood, yet through her book, Mary gives us a glimpse into a world which is foreign to many, yet so relatable to others. Being forced to grow up long before her time and when life seemed hopeless, she handled it all with grace and dignity and grew to be a woman who has provided hope and inspiration to countless people. Reading it, I was moved beyond words and transported to a world I knew little about. Her writing captured my attention and heart, intriguing me every step along the way, keeping me turning pages as fast as I could. It is my honor to have Mary A. Perez with us today to talk briefly about her recently released memoir, Running in Heels: A Memoir of Grit and Grace. 1) When did you decide you wanted to write a memoir? How long did it take for you to complete it? Initially, I just intended to write for the sake of my children. I felt they needed to know some history and of the struggles their Momma endured. It took me about five years writing solo, until I joined a writers’ group and stuck with them for a couple of years. It was one of the best things I did as a writer. 2) What were the hardest /most challenging parts for you in writing this book? And what was the most enjoyable? A) The most challenging part of writing for me is to remain focus. Nowadays there are way too many distractions. Then I would have to say, re-visiting the loss of my loved ones, as well as the abandonment and rejection were the hardest. B) The most enjoyable part of writing for me were the stories told by my family–especially my dad–the birth of my children, and finding my one true soul-mate to share the rest of my life with. Yes, God gave me a second chance! 3) If you could pick one, what stands out as the most trying time or event in your life? What do you attribute your strength and determination to overcome it? There are more than one trying episodes and a few daunting periods that stand out throughout my journey. I will name three that come to mind: Learning to love and honor my mama no matter what, learning to forgive myself and accept my special-need child, and learning to let go of past offenses, and allow God to do a new thing in me. I learned resiliency early on. Grit kept me going, but God’s grace got me through. 4) How has your faith evolved throughout your life? I believe faith got me through the storms of life, without which, I would have withered long ago. Not faith in my faith – but faith in an Almighty God who can make a way when I thought there was none. In her book, Mary shares her experience of grieving the passing of her sister and shows us the impact such a loss had on her in many ways. Would you share a few words about the loss of your sister Anna and how it impacted you, both as a child and as an adult? When I lost my little sister, she was only two-years old. I felt I had lost my best friend. She was an integral part of my life. Anything we did together was better than doing it alone. Somehow in my child’s mind, I had known she wouldn’t be with us for long. It wasn’t until my late forties when I visited her gravesite, devastated to see the stark reality of nothingness. No tombstone with her name, no flowers, or grass. Just hard soil. And weeds. That barrenness and empty feeling re-surface in my soul and I broke down. I dropped to my knees and sobbed and emptied my heart. I spoke to her as if she were right there listening. Wow! What is your favorite memory with her? What, if anything, have you found to be helpful in your grieving over the years? A) My favorite memories of my little sister was in our quiet times together. It was just the two of us. We’d play, color, eat, pretend, watched some TV shows and said our prayers at night. But my all-time favorite memory was our walks together. She loved those walks, exploring the world around her. She loved nature and flowers. We’d pick wild flowers to take home to Mama. She loved people. Anyone that passed us would always comment on her angelic presence. B) As a Christian, I have that Blessed Hope that I shall see her again one day. She cannot come to me. But I will go to her. Thank you Mary so graciously sharing such a personal part of your life with us. 5) What do you want people to take with them from this book? How has your life changed since? A) I would hope that my story will show others that anyone who has made mistakes can still be a person of worth! Your yesterday does not have to define your today. B) My life of peril became a life of promise. I am no longer that lonely, insecure younger self. I have a voice. I am valued. And I am loved. I’ve learned to confront my past, live in the present and look forward to the future! 6) What will you be working on next? I will be working on certain topics regarding life’s issues. It may be told in vignettes. It may be a collection of essays. In her book, as a child Mary experiences the death of her little sister. This chapter really impacted me and was so full of emotion as I wondered how exactly a young child was impacted by such a tragic and deep loss. Her point of view reveals that even children carry the grief and devastation with them throughout their entire lives. It never goes away. In conclusion, if you could give advice to others enduring their own struggles of survival, whatever it may be, what is the most important piece of advice you would give them? We all face struggles, and fight battles in one form or another. I’ll be the first to say: There are no quick-fixes. I’m not saying it’s easy, but please don’t think that you have to walk it alone. It is not always smart to become isolated and a shut-in. When this happens we tend to go through the motions in a half-baked frame of mind if there are small children present, (this is no bueno). Some will even medicate themselves be it with drugs, alcohol, food or even shopping! Please seek help from someone somewhere! There are many organizations, help centers and help-lines. There are communities and churches. I don’t believe in telling your business to everyone, but you must open up to someone for support and encouragement. Try writing down your feelings. The main thing is to stop doing the same thing over and over, expecting different results. That’s just pure insanity! Get rid of your stinking-thinking and limited mentality. Don’t just complain or talk a good talk. Put that talk into action by doing something positive. I believe it takes a made-up mind. Know that as long as you have a pulse, you have a purpose. Listen, we can be bruised but not wounded, scarred but not broken. We can overcome our yesterdays and walk in wholeness and completeness today. And there you have it. Beautiful words spoken from Mary Perez. Priceless advice from one heart to another. Thank you again Mary. 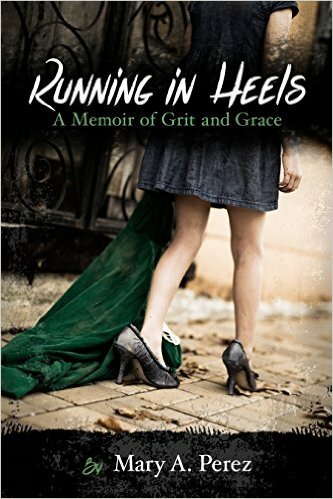 Please comment or share this post to be entered into a drawing to win a copy of “Running In Heels”! Winner to be announced Wednesday!